Dynamic movement can be provided at various areas of the body where movement is possible from a seated posture. The dynamic component allows movement beyond the usual seated posture, such as into increased trunk extension, and then assists with the client returning to upright. Ideally, the return to upright does not lead to a loss of position, such as a posterior pelvic tilt. Most frequently, movement is allowed posteriorly, opening the seat to back angle. Upon return to upright, the pelvis is at risk of falling into a posterior tilt and being pushed forward. The pivot point of the dynamic component is critical to the client returning to upright with a neutral pelvic position, and should be as close to the natural pivot point as possible (see photo). 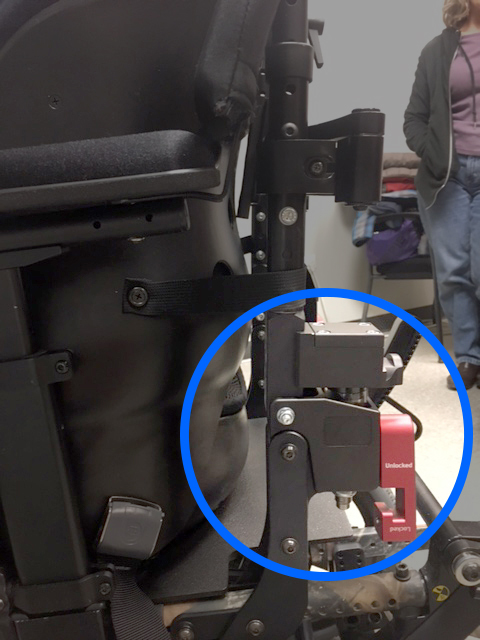 Some components only allow very small movement and are designed primarily to protect against a broken wheelchair backrest or other seating hardware breakage. These components are less likely to lead to a loss of client position as so little movement occurs.